Are you someone who always has their head in a book? If so, read on to learn about the top book tattoo ideas for bookworms. Are you a literature lover in need of a new tattoo? You’re not alone. 4 of 10 U.S. adults have at least one tattoo, visible or not. Tattooed individuals are also unlikely to stop at just one inking. That first tattoo often inspires more, especially if you’ve found a tattoo artist who truly understands your creative expression. The sky really is the limit when it comes to tattoo designs, though. If you’re a bookworm in need of some inspiration, keep reading (pun intended). In this post, we discuss the top book tattoo ideas every word lover is likely to appreciate. Read on! Most bookworms adore the smell of the pages of a new novel plucked from a bookstore shelf. There’s nothing quite like the feel of fluttering pages, either, even if you have your Kindle on you at all times. Express your profound love of the page by literally inking it into your skin. Your booklover’s tattoo may, for example, involve the image of an open book with fluttering pages. The best designs we’ve seen portray some of these pages actually fluttering out of the book itself. Some of these loose sheaves turn into birds, taking flight out of the book and across your skin. With the fluttering page design, simpler is better. We recommend leaving text out of this design, letting the image of fluttering, blank pages stand on its own. Do you crave curling up with a book next to your beloved feline? Plenty of literature lovers would agree that animals and books pair extremely well together. Consider getting a tattoo that displays your adoration for both. An iconic image in this regard is an animal perching on top of a stack of books. If you like owls, get a tattoo of a Great Snowy White with its claws digging into your favorite texts. If you’re more into claws than feathers, dream up a design that shows a kitty leaning up against a tower of books. If you don’t like the idea of a stack of books, stick with just one text. Other animals that make for an excellent design include birds, wolves, and jungle creatures. Books can really be magical, inviting anyone to step into another world for a short spell. If you’ve caught the allure of reading, express this in a tattoo. Your tattoo may show an open book whose pages are actually the cresting waves of an ocean, for example. Or you may ask your tattoo artist to inscribe the image of a book surrounded by the cosmos, including stars and moons. Love Harry Potter? Pair the image of a book with a wand, wizard’s staff, or ancient rune. This is a great design for individuals who want a colored tattoo. 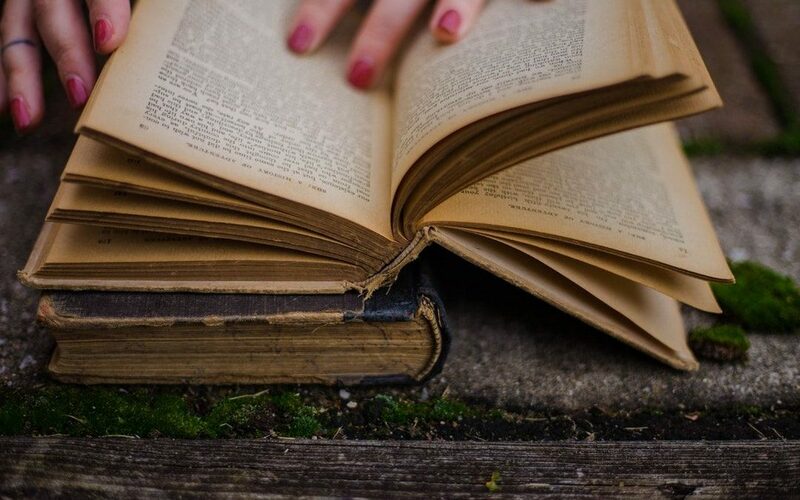 You likely can recall a few sentences from your favorite books. Why not make those sentences a part of you? Inscribe a quote of the first line of your favorite novel on your forearm. Or ask your tattoo artist to ink a few words from your favorite poem in a circlet around your ankle. If you’re having trouble coming up with some great literary quotes, check out this article for inspiration. If you do choose to get a literary quote as a tattoo, think carefully about how you would like those words arranged. Sometimes it’s nice to inscribe quotes into tattooed banners or ribbons, for example. Or perhaps you want to display a quote with the image of a book as its background. Your tattoo artist can help you explore other ideas about using quotes, too. Pay homage to the ancient past of books by getting a tattoo of a quill and/or ink bottle. The image of a quill is easy to incorporate into almost any tattoo design, because it is so feathery, light, and tapered. This makes it ideal to use in larger-scale and smaller-scale designs. In fact, if you are getting your first tattoo, you may be thinking of a smaller, more discreet design. A quill is perfectly suited to this, especially if you tattoo a tiny quill on your wrist. If you’re musing about how best to show off your literary quote, why not get a tattoo of the image of a quill actually writing that quote on your skin? If quills aren’t your jam, you can always resort to a classic of book tattoos: the image of the reader. In this book tattoo design, we get an actual glimpse of someone in the act of reading. This reader doesn’t necessarily have to be you. You can get a tattoo that shows an animal reading a book, for example. Or you can merely suggest a reader with the image of a pair of hands gripping an open book. Another tattoo design that celebrates the art of reading may show someone reading a book on a windowsill, gazing out at the stars. If you’ve been thinking about getting a tattoo sleeve, consider one made entirely of inked pages or the titles of your favorite books. You may also wish to inscribe an entire poem or favorite paragraph on an arm (or both). Bookworms may also appreciate the idea of bookshelves wrapping around a forearm or tricep. If you want a subtler sleeve, return to the fluttering pages idea, and inscribe loose sheets of paper fluttering up and down your biceps. Tattoos give us all a creative opportunity to showcase our passions. If your passion involves books, why not permanently etch this love into your skin? When it comes to book tattoo designs, most people opt for the image of a book itself. An open book with fluttering pages can do nicely here. Or you may wish to combine the image of a book with other things, such as sprouting flowers, animals, or stars. You can also always get a tattoo of your favorite quote from literature. Hungry for more tattoo inspiration? Check out this post on tattoo trends you don’t want to miss!